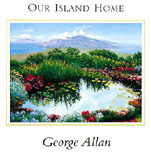 'OUR ISLAND HOME' contains 23 paintings by George Allan with an introductory essay by Lynn Shue. The paintings are handsomely reproduced and accompanied by carefully selected details, as well as the artist's commentary on his subject matter, artistic techniques and remarkable life story. 'GEORGE ALLAN: 'OUR ISLAND HOME' is a limited edition of 1000 copies, each signed and numbered by George. 'OUR ISLAND HOME' is not only a beautiful Art Book, but is eloquent in portraying George's love of Maui in both words and images. The book consists of 96 pages on fine paper and measures 11.5" x 10.25". It is hard bound, with an inside ribbon marker, and enclosed in a protective mailing carton. Personal inscriptions may be requested. [or free with the purchase of any original painting]. Aloha Expressionism, published in November, 2015. It’s a coffee table book you’ll love to peruse over and over again. There are a total of 50 Hawai’i artists from the 4 main Hawaiian islands. All art media are included and are excellent!